The snowball is getting bigger! 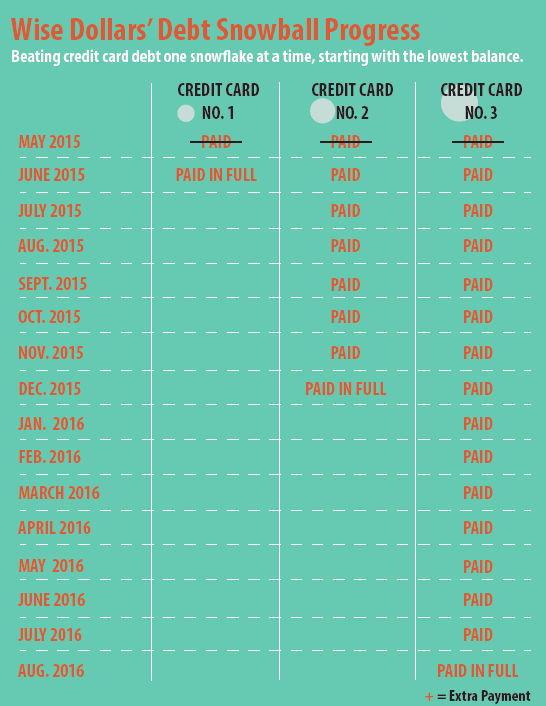 This month, I rolled over the payment from Credit Cart No.1 into Credit Card No. 2. I also added a bit more to the amount each month so that I’m not paying a small bill in December. It was so odd and disheartening to see such a large amount of money go to one creditor. I’m excited for the day when that money will come to me and no one else. Those dollars will go toward retirement, other investments, savings or big purchases I’ve longed to make. I can’t even remember what I purchased with the credit card. Isn’t that a shame! Whatever I bought probably wasn’t worth the aggravation it’s giving me now. I’ll remember this feeling so I won’t go into more credit card debt when I break free. By this time next year, I will be free. God-willing, I WILL BE FREE. Being happy to pay the bills. Is there such a thing? INDEED, THERE IS! I woke up this morning excited to check my bank account and see it reduce because my automatic payments had been withdrawn. Then I grew more excited to pay my Internet and cable bill. Why would anyone be excited to see their funds reduced? Reason No.1: I had the money to pay the bills. Of course, I’d like to see my coffers full at all times, but I’m not worried about withdrawing too much or not having enough money to begin with. So many other people are. I used to be in that position a few years ago. After graduating with my master’s degree and getting my job, for which I just had my two-year anniversary last week, I started keeping an online spreadsheet of my bills. The spreadsheet goes back to September 2013. At that time, I had absolutely no control or schedule in regards to my finances. Bills would come in, and I’d set them aside. Then after a few weeks, I’d look around and go, “Crap! Is that credit card bill due today? !” Thus, the scrambling would begin. I got tired of it. Sometimes, that’s what it takes to change. The spreadsheet helped me put everything in one place — what I owed and to whom, when the payment was due, and the amount of the payment. It held my regular payments and medical bills that would come up time to time. Little did I know, this was the beginning of a budget, which I tried to avoid like the plague. 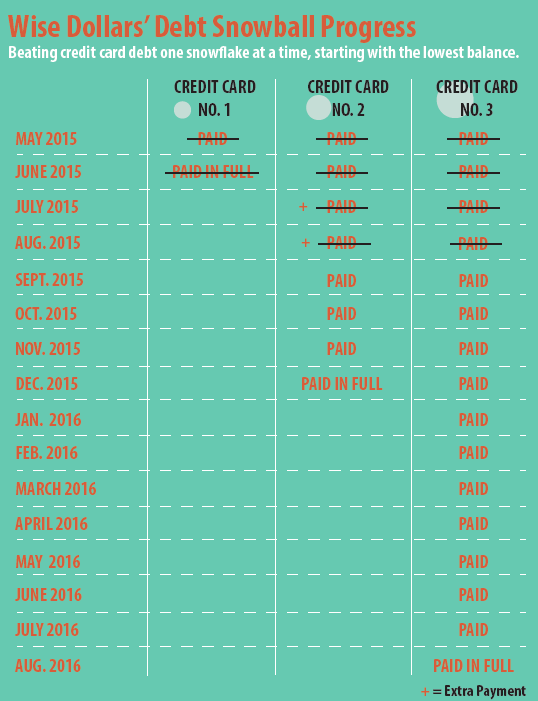 Those rows and columns helped me plan where my two paychecks (and freelance money) would go each month. Then I got on the schedule of paying bills on the 1st and 15th. It has saved my life, made me happy about payday and happy about paying the bills. I think Michelle Singletary wrote that one should make bill-paying a celebratory event. You have the means to pay the bills, so be grateful and think positively. Heck, maybe drink a little wine while pressing “Submit Payment.” Wine Wednesday. Why not?! Now, I’m not saying that I love bills. The fewer, the better. But I’m grateful to have the means to take care of them in a timely manner. Here’s Reason No. 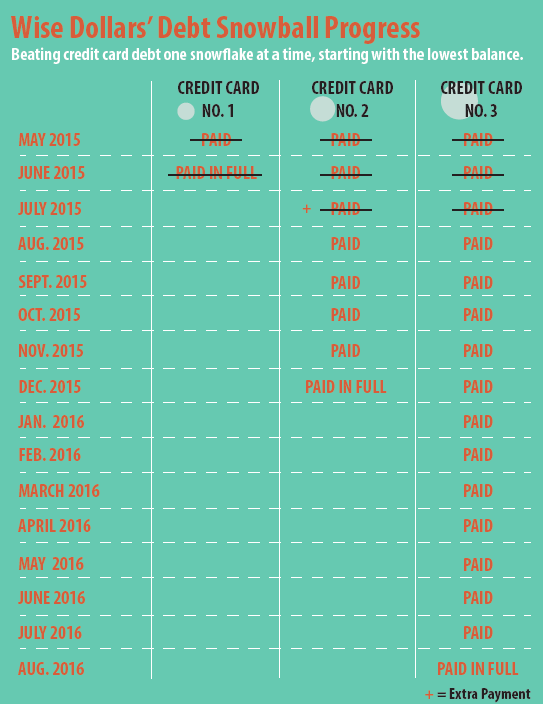 2 for my happy, post-bills state: I PAID OFF A CREDIT CARD! Woo hoo! I finally paid off the credit card I used to take care of car repairs. I planned to pay it off in April, but guess what—I had a major repair in April and split that bill between my savings and the credit card for the 0% interest for six months. It’s been a long while since I paid off a card. This is a nice little victory. Now, only two cards stand in my way. These cards aren’t incurring interest thanks to balance transfers. After getting out of credit card debt, I’ll start killing off student loans. “If it ain’t one thing, it’s another,” the great Frankie Beverly sings. But the good thing is: I’ve got a plan. And I’m working it. I’ve already rolled over the payment from Credit Card No. 1 into Credit Card No. 2’s next payment. I pray that I continue down this path with little resistance.